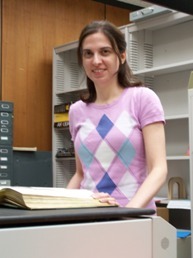 Diane Biunno, a graduate student in Drexel University’s Master of Science in Library and Information Science program, is the Digital Library intern for the summer semester. Biunno says that the internship will enable her to learn how a digital library functions, perhaps promoting her decision to enroll in the Drexel’s Digital Libraries concentration. As part of her internship Biunno will create an online exhibit about Dante, “an illustrated journey,” using materials from Falvey’s Special Collections. Her own research interests focus on Dante and medieval literature. Biunno decided to become a librarian after working in education, teaching Italian at the secondary and university levels. Her library science degree, she notes, will continue the track. She has a bachelor’s degree and a PhD from Rutgers University, New Brunswick, N.J. Her undergraduate degree is in Italian; for her doctorate she specialized in Dante. She is a native of Brick, N.J.
Usually interns choose their projects about four weeks into their internships, but given Biunno’s dissertation on Dante, she chose her online exhibit topic at the beginning of her internship. Her hobby is 1930s and 1940s style dancing. She is currently reading “a whole bunch of stuff for school,” and for fun she just started reading Wicked: The Life and Times of the Wicked Witch of the West by Gregory Maguire, the book from which the musical “Wicked” is derived.